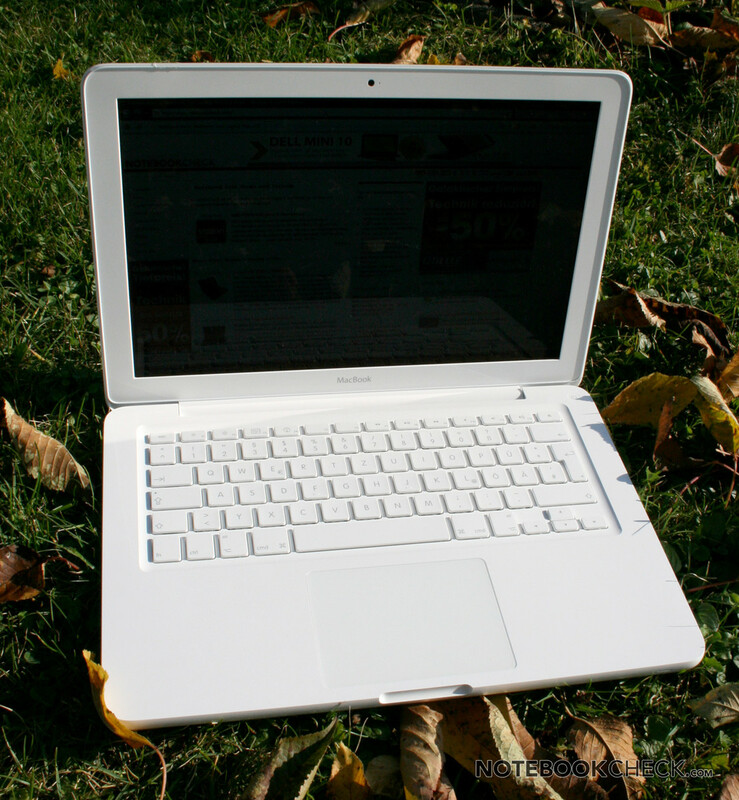 The white MacBook is the least expensive Apple laptop, intended to be a portable multimedia entertainment system. This latest update is now available under the model name A1342, version MC516D/A. It differs from the previous model mainly in its new GeForce 320M graphics card. The white plastic case of this latest MacBook is exactly the same as its predecessor. For this reason parts of the following sections are based on the 2009 MacBook review. 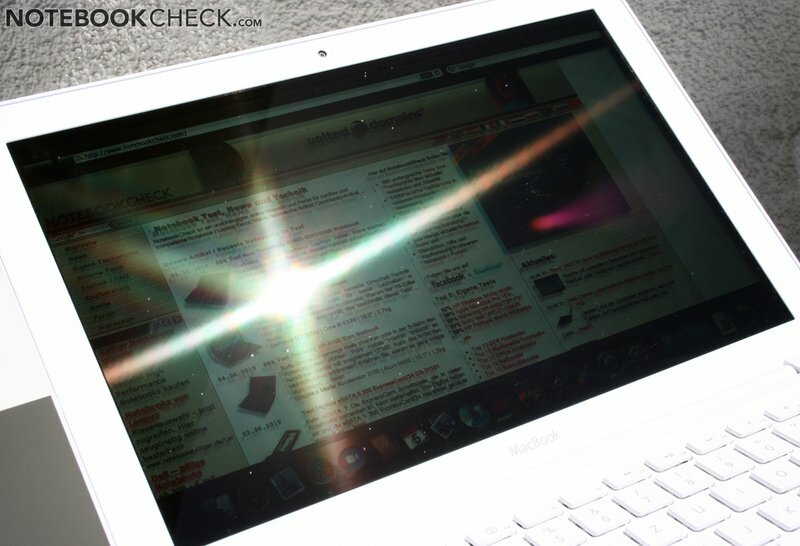 Apple has stuck with a completely white look with numerous glossy surfaces, although these have an inherent tendency to pick up scratches and fingerprints. 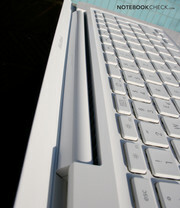 The design has been brought more into line with the unibody MacBooks - its simple elegance is very appealing. The case is very robust, despite being made of polycarbonate (a high-grade plastic) instead of the aluminium of the MacBook Pro. It only gives way very slightly under pressure in the area of the slot-loading DVD drive. We were not able to make our review model creak or flex. The rubberized underside of the MacBook is interesting. It is strengthened by an aluminium plate on the inside, and replaces the need for rubber feet. Since air is sucked in and blown out from the back of the machine, there is no particular need to leave space between the laptop and the desk surface. The new plastic MacBook weighs somewhat more than the 13" unibody MacBook Pro. But 2.1kg is still very portable and perfectly normal for a 13" multimedia laptop (for instance the Dell Studio XPS 13 weighs 2.2kg. The meagre selection of ports is also unchanged in this plastic MacBook model. 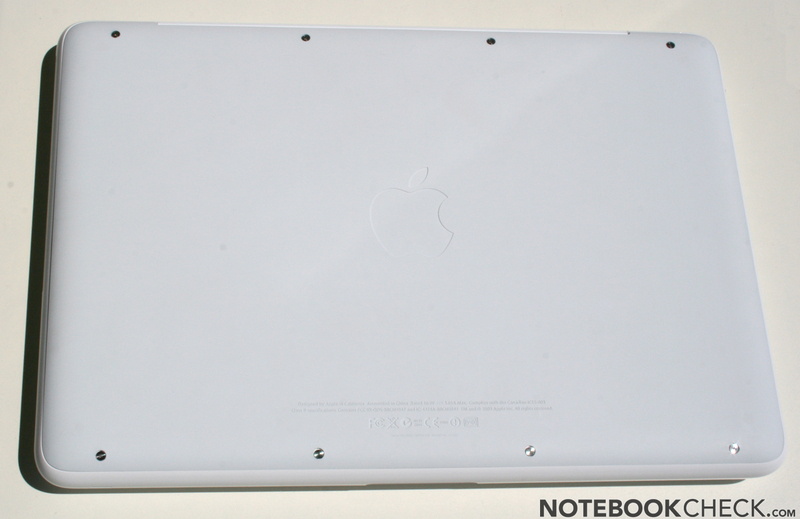 There are just six ports altogether, all positioned towards the back of the left side of the notebook. 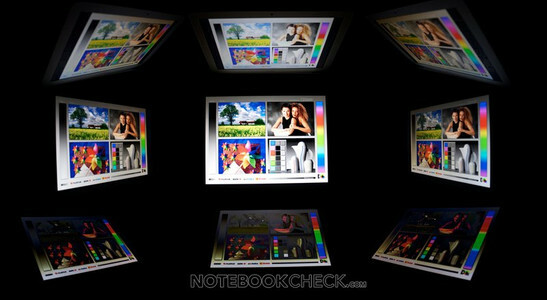 The highlight is definitely the mini-display port which can output digitally to monitors as large as 30 inches. However, for the majority of screens you would need to purchase an adaptor to use this. The two USB 2.0 ports are very close to each other, which is less than ideal. Also, having only a single audio port seems rather stingy. It allows optical or analogue output for normal jacks; but it can act as both input and output port with the Apple headset. 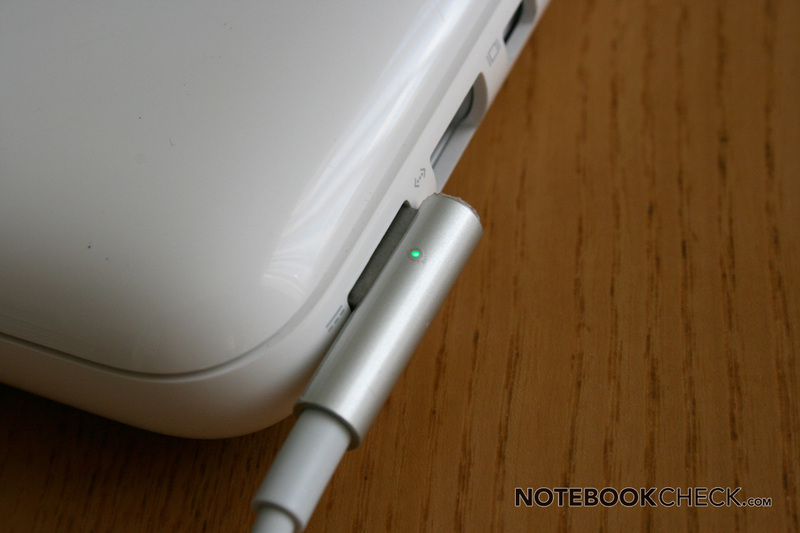 There is also a Kensington lock slot for securing the notebook, as well as the ingenious MagSafe power socket. 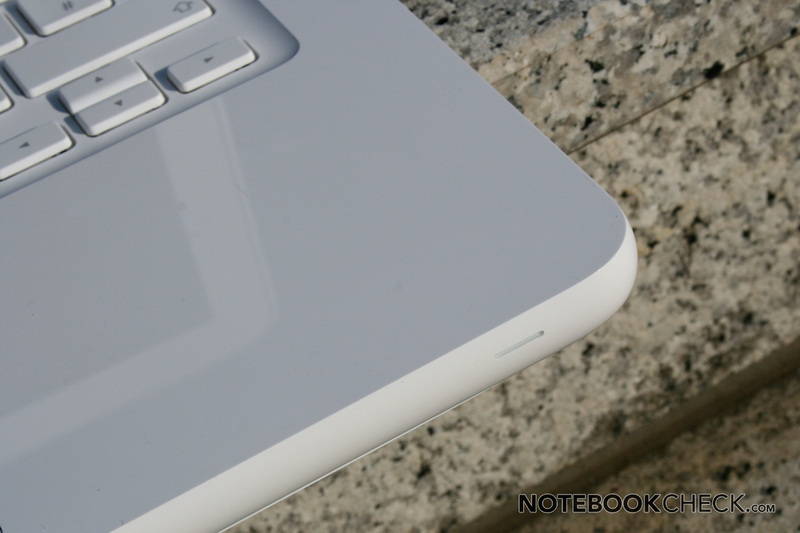 Compared to the 13" MacBook Pro, this MacBook is missing FireWire and an SD card slot. MagSafe power socket, Gigabit LAN, mini-display port, 2 x USB 2.0, analogue/ optical audio output or iPhone headset connection, Kensington lock slot. 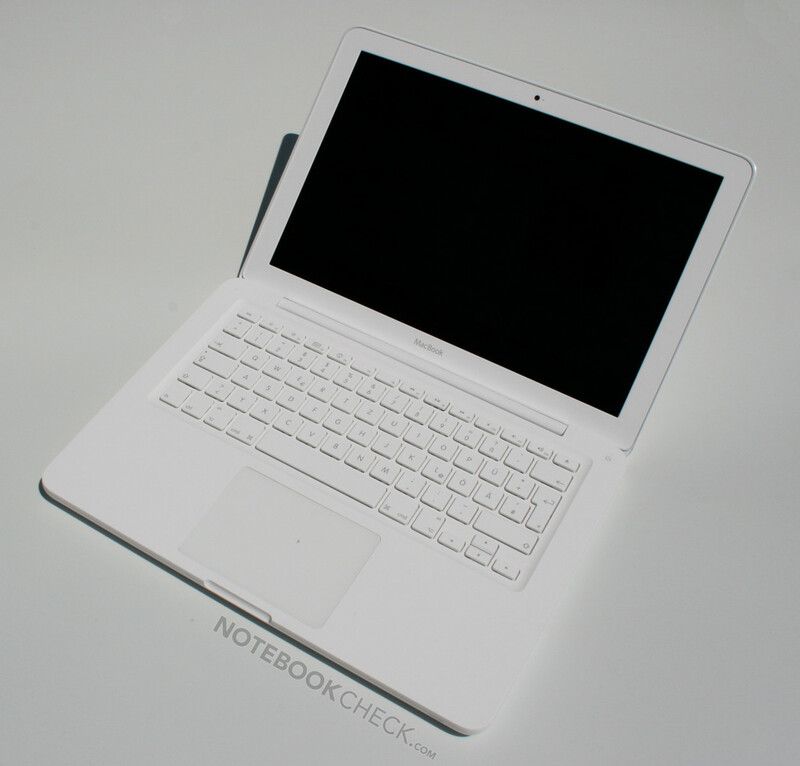 In terms of wireless connectivity, the unibody MacBook offers Atheros Draft-n WLAN and Bluetooth 2.0 +EDR. The software pre-installed on the new white MacBook is standard for a Mac. The newest Mac OS X (in this case Snow Leopard 10.6.3) and the iLife software suite (iMovie, iPhoto, GarageBand, iWeb and iDVD) are included for your everyday needs. As usual, Windows can also be installed with the help of Boot Camp, but you need to purchase your own Windows version. 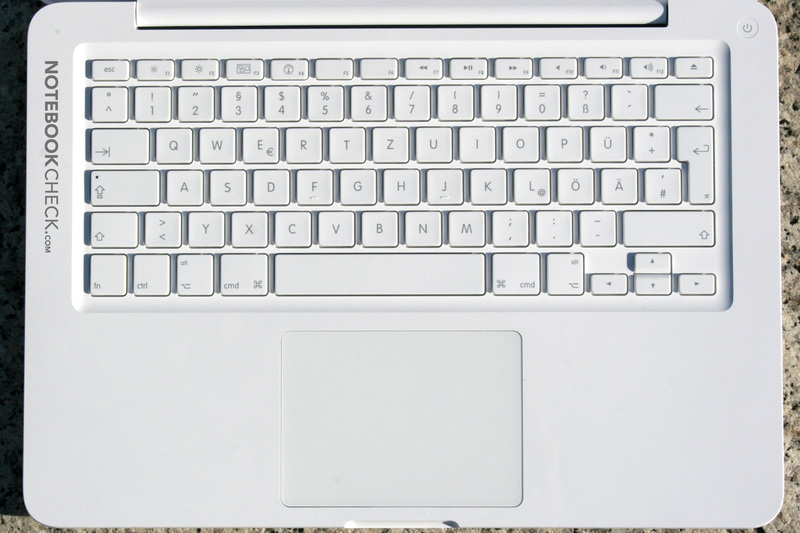 The island-style keyboard is the same as on the old white MacBook. The white, free-standing keys seem to be of a slightly lower quality than on the MacBook Pro, and the impact feels marginally harder. However, the layout is identical to all other Apple keyboards, including the desktop machines. It may be a little tricky for Windows users to get used to. 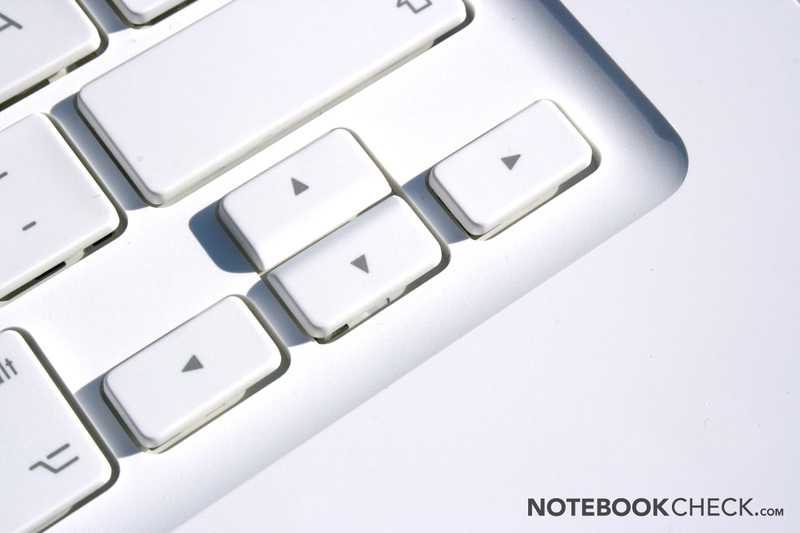 Sadly, the extremely useful keyboard backlighting has been left off the white notebook model. But, overall we like the keyboard very much, and would rank it only just below the first-class keyboard of the MacBook Pro. The glass touchpad (called trackpad by Apple) now has inertial scrolling in this latest refresh. This brings added momentum to your scrolling gestures, so to speak, which is particularly helpful when reading long webpages. 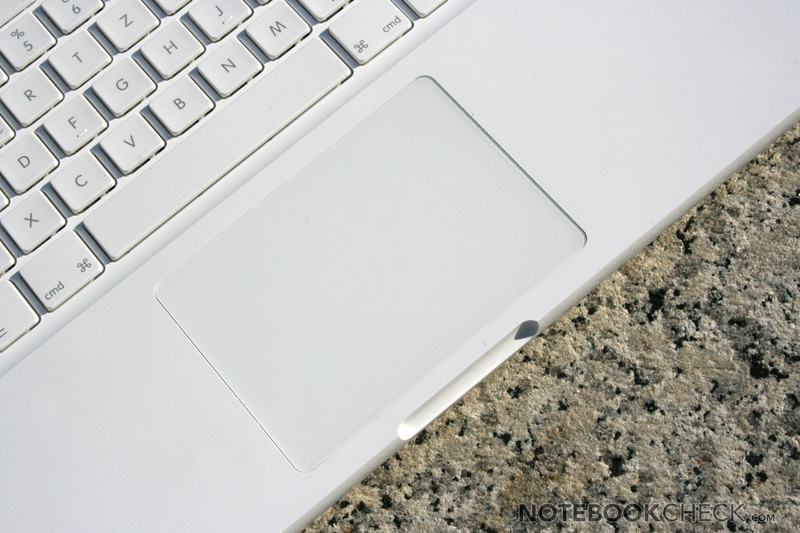 The touchpad still has an excellent silky surface and no separate touchpad buttons. As before, it recognises a multitude of gestures using up to four fingers. One downside is that Windows still does not support the touchpad as well as the Mac OS drivers do. The glossy 13.3" widescreen display with LED backlighting has a pleasantly high native resolution of 1280 x 800. With this polycarbonate MacBook, Apple has decided against the glass screen enclosure, as well as any kind of anti-glare finish. 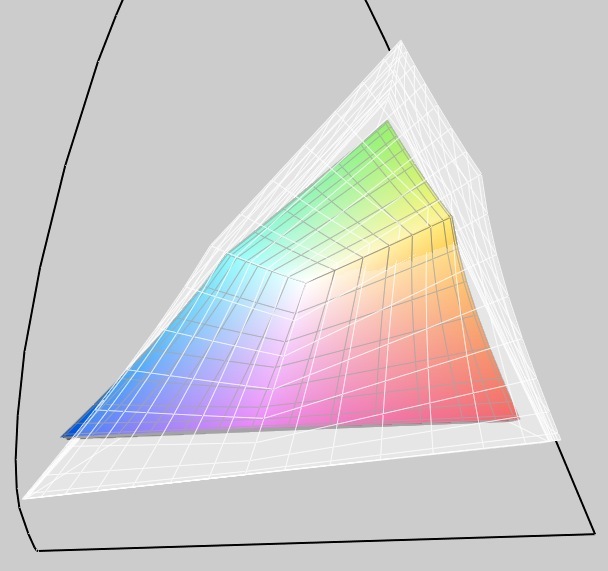 The brightness is good, at an average of 227 cd/m², but it does not quite attain the levels of the MacBook Pro. The distribution of brightness is more average at 73%, but you cannot really make out any unevenness with the naked eye. Thanks to the good black level, the maximum contrast ratio is an excellent 791:1. Despite the screen's good maximum brightness, it picks up strong reflections when used outdoors or whenever a light source is behind you. However the white MacBook can be used without problems in a shady spot. The range of viewing angles for this TN display (model LTN133AT09) is above average. 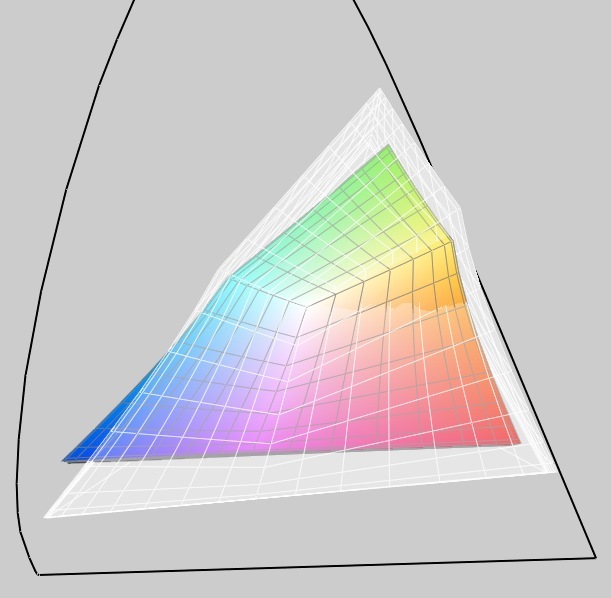 As usual the colours remain stable for wide horizontal angles but quickly change when viewed from above or below. 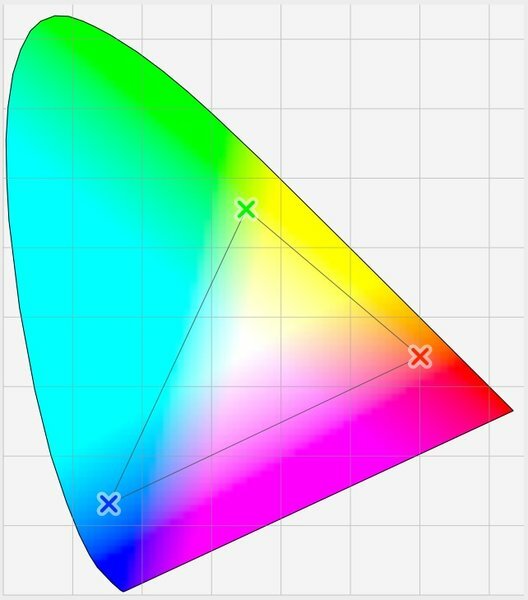 The 13.3" screen's colour gamut is comparable with the 2009 model, which is to say some considerable way behind the MacBook Pro. 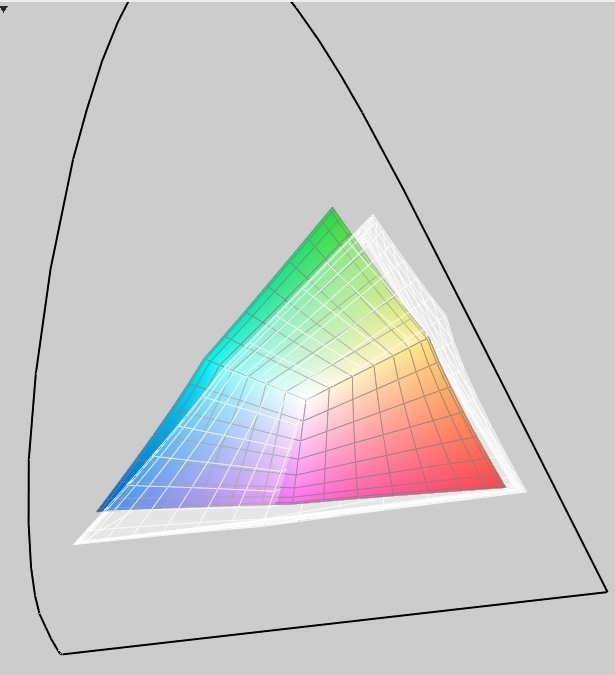 This means the screen is less suitable for graphic designers or photographers. The white MacBook still uses a Core 2 Duo processor. Accompanying it is the Nvidia Geforce 320M, a graphics card integrated into the MCP89 chipset. It is the successor to the GeForce 9400M. This brings the hardware up to the level of the most basic MacBook Pro, the MacBook Pro 13", apart from the smaller memory (2 GB rather than 4 GB of DDR3 RAM). The older Intel Core 2 Duo P8600 is a dual-core processor with 3 MB of level 2 cache and a 25 Watt TDP. 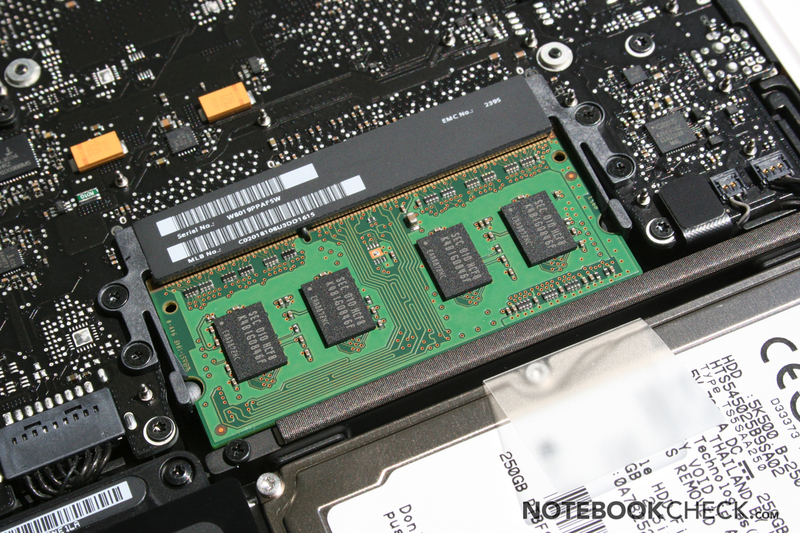 This makes it one of the more energy-efficient Core 2 Duo processors. 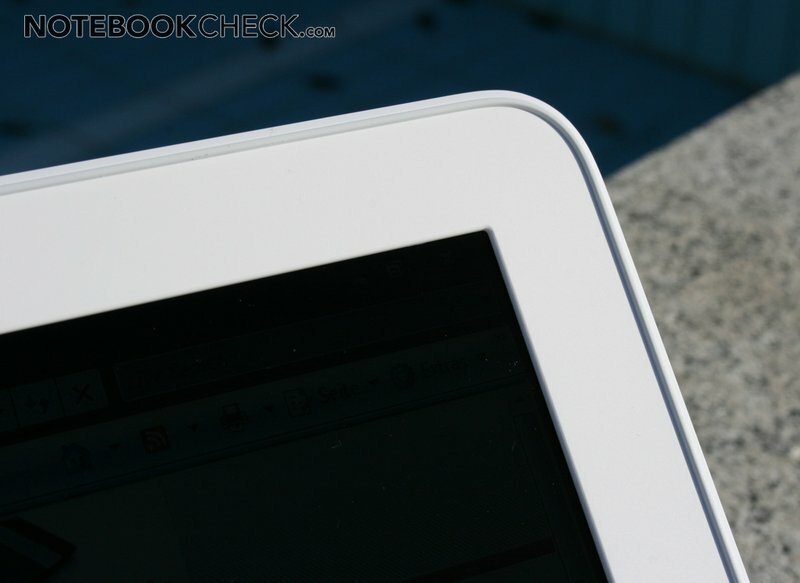 However, the P8600 is not a patch on the Core i5 and i7 models which have been used in the 15" and 17" MPBs. 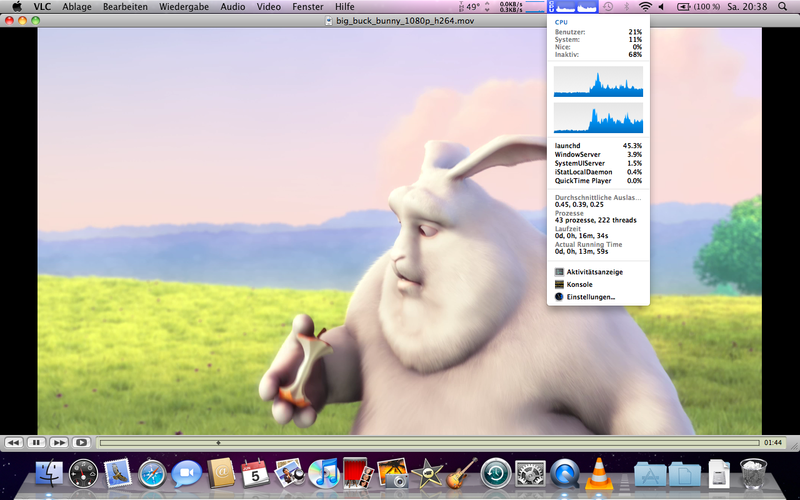 In Cinebench 11.5 the Core i5-520M in the MBP 17 is faster by 57%, while the i7 (tested in the 15" MBP) is 79% faster. A similar picture emerges from the older Cinebench 10 test. 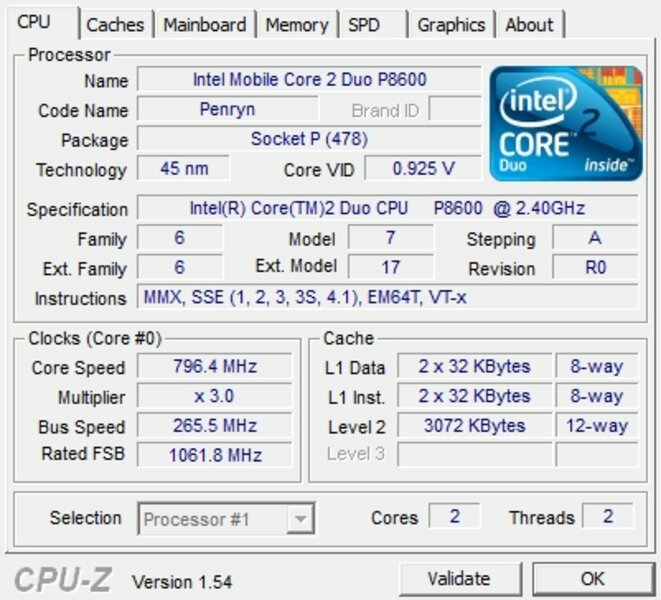 The P8600 trails the i5 by 45%, and the i7 by 60%. In wPrime the i5 and i7 are closer together, beating the Core 2 Duo by 48% and 52% respectively. In the CPU part of the 3DMark Vantage test, the difference is most marked. The new dual-core processors show their dominance with 71% and 87% leads, thanks to hyperthreading and turbo boost technology. 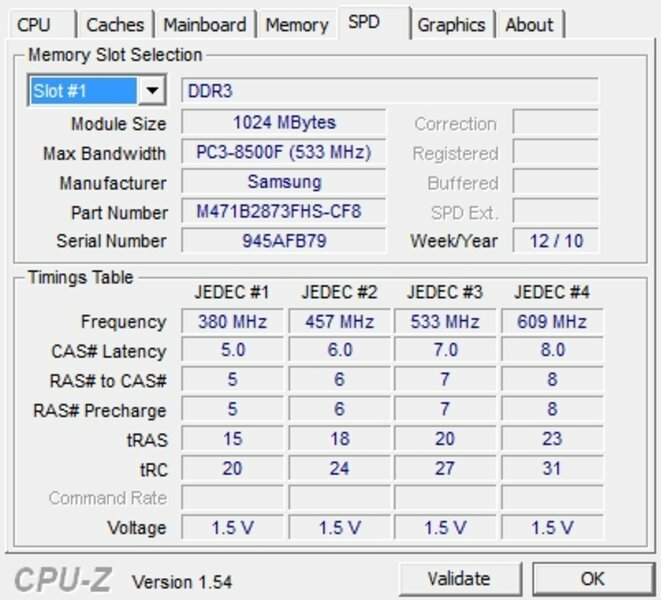 One reason for sticking with the Core 2 Duo processor was surely the new Nvidia GeForce 320M, successor to the GeForce 9400M. The 320M graphics card is integrated into the MCP89 chipset designed for use with Core 2 Duo processors. 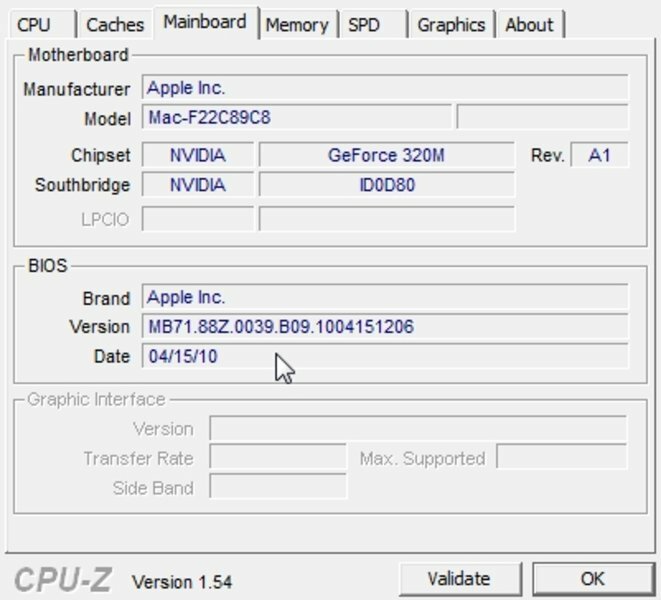 Having 48 shader cores, the 320M is similar to the dedicated GeForce GT 330M, but does not have its own memory, instead sharing 256 MB of the main memory under Mac OS X. More details on the GeForce 320M can be found here. 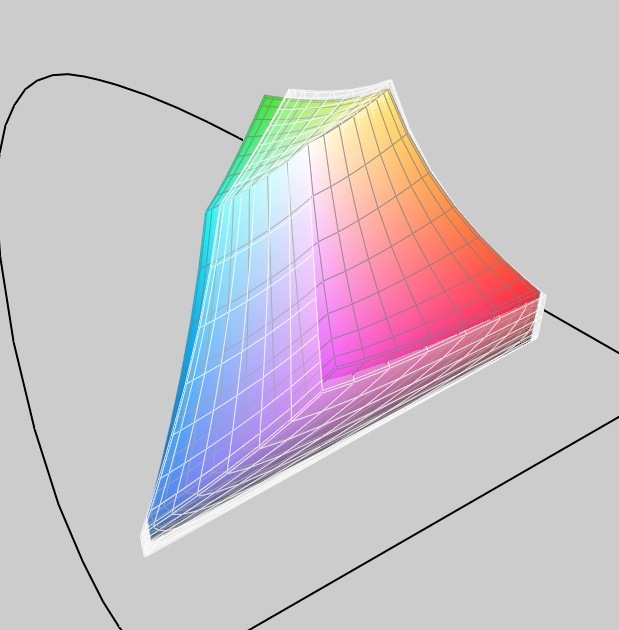 The new 320M really showed its strength in the theoretical graphics benchmarks. In the 3DMark06 test, the 320M scored double what the old 9400MG scored, and was approaching the score of the GeForce 9600M GT in the old 17" MBP (which was only 23% faster). 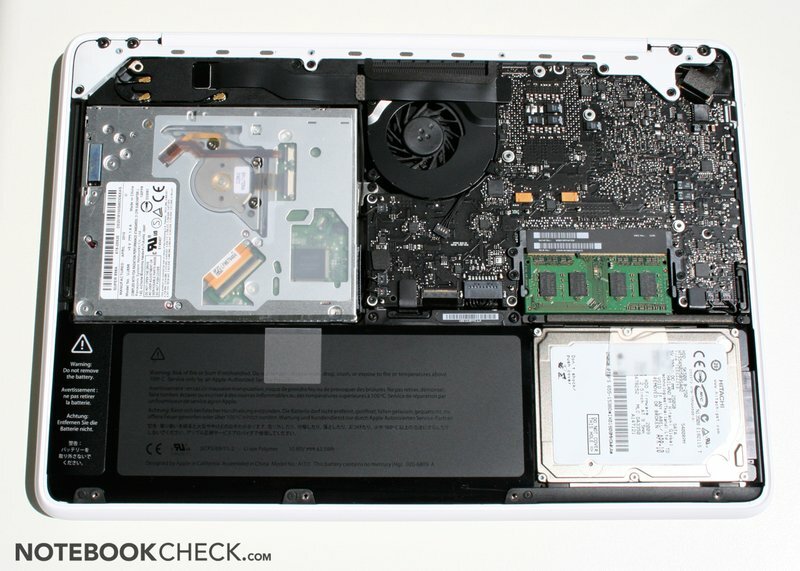 The GeForce GT 330M in the new 15" and 17" MBP is faster still by about 42-44%. It was a similar story in the 3DMark05, with the new 320M coming in at about the same level as the 8600M GT (which it beat in the 3DMark06 test). In the PCMark Vantage test running Windows 7, the white MacBook surprised us by putting in a better performance than the old 15" MacBook Pro with Core 2 Duo T9600. However, the new Core i5 and i7 MBP models are 47% (MBP 17 with Core i5) and 50% (MBP 15 with Core i7) faster. Despite being roundly beaten by the new Core i5 and i7 processors, the notebook's application performance actually feels very good. 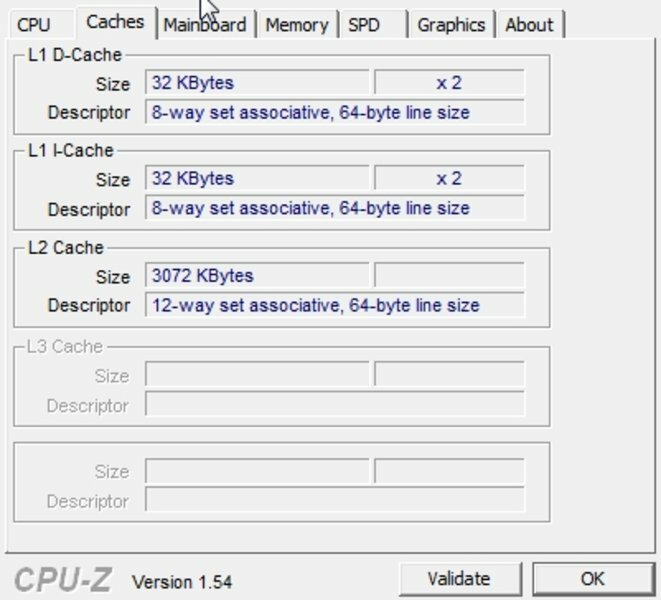 The Mac OS X benchmark 'XBench 1.3' tends to produce a wide spread of scores, so it is wise to regard the results with some scepticism. 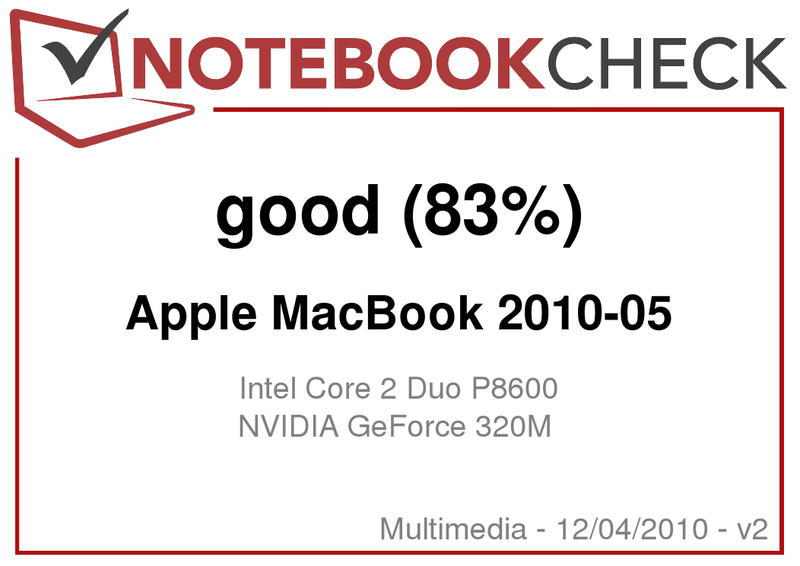 Compared to the 2009 MacBook, this new version performs considerably better in the Open GL section thanks to its GeForce 320M. It beats the integrated GMA HD in the MBP 17 by some margin, and is not far behind the GT 330M. Thanks to a faster Core 2 Duo, the CPU result is also somewhat better than the previous model. Why the MacBook seems to be so far behind in the user interface and thread sections of the test is not readily apparent to us. 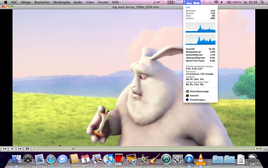 Best of XBench 1.3, the MacBook compared to the current 17" model with Core i5 and the old version from 2009. 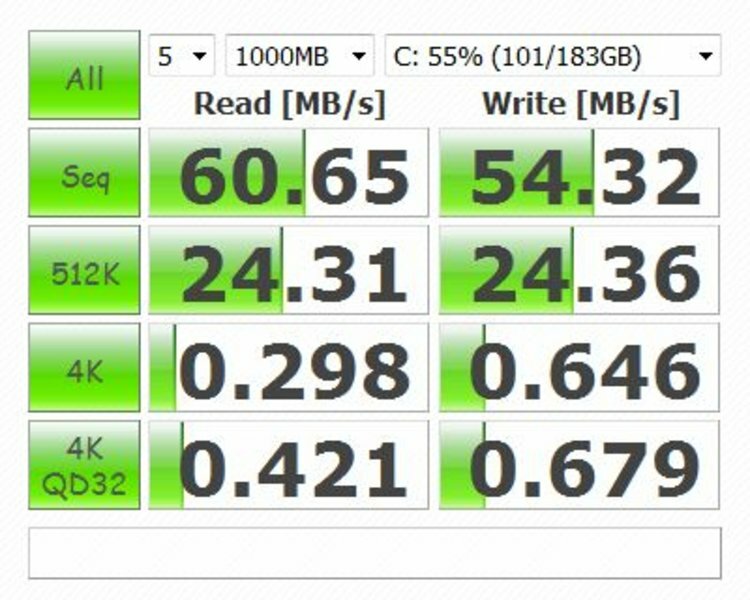 Using a Boot Camp partition, the Hitachi 250 GB hard drive achieved above-average results of 37-82.4 MB/s (HDTune). 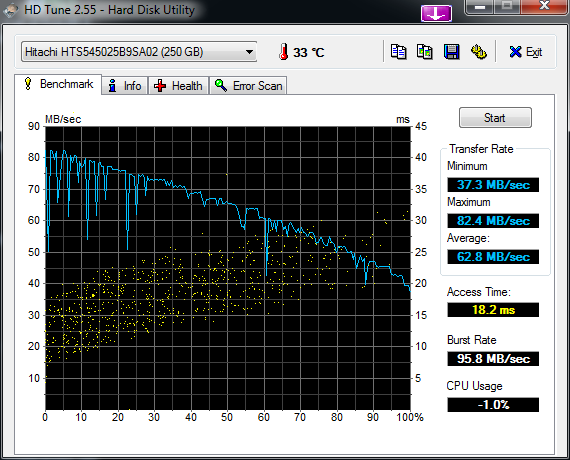 But the best thing about the 5,400 rpm HDD is that it runs very quietly even when being accessed. 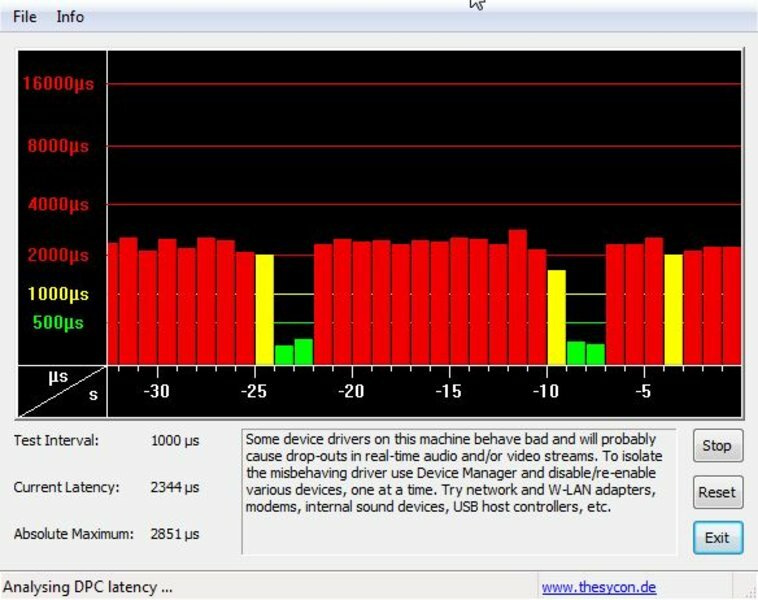 In contrast to the 15" and 17" MacBook Pros, the white MacBook is plagued by high DPC latencies when running Windows 7. After disabling WLAN, Bluetooth and LAN and closing Apple tools (hotkeys), the latencies are still too high at just under 2,000 microseconds. In the practical gaming benchmarks, the 320M (the fastest GeForce chipset graphics card so far) came in at about the same level as the ATI Mobility Radeon HD 5470. The performance varied a little from game to game, since the 320M does not have its own dedicated memory but has to share the main memory. Older Windows games (like those based on Half Life 2) run smoothly on the GeForce graphics card even on high detail settings. However, it can only manage the lowest detail settings on the most recent and graphics-intensive games. Thanks to the powerful hardware, FullHD videos do not pose a problem when played directly from the hard drive. 1080p videos can be played smoothly, whether they are supported by the graphics card (as with Quicktime in Mac OS X or Windows Media Player in Windows) or not (e.g. VLC media player). Flash web content in 1080p reaches its limits with just the CPU (playing smoothly when tested on full screen but with some dropped frames when played in a window); but with Gaia Beta and the support of the GPU, the 1080p content ran smoothly in its own window. 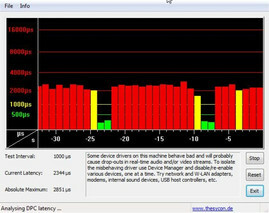 Low system noise continues to be a strength of the Apple laptops. The single fan stays at its lowest level of 2,000 rpm when there is little or no system workload, and at this speed it is barely audible (29.2 dB). 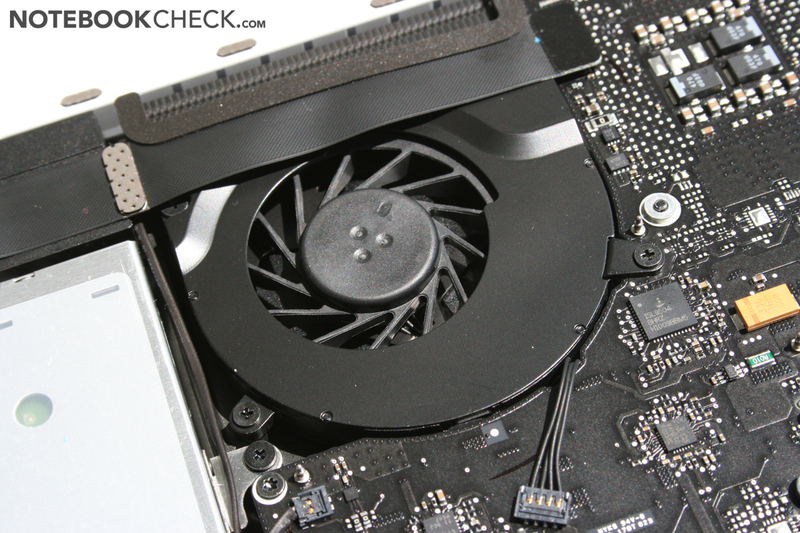 The fan stays at 2,000 rpm for longer when running Mac OS X; and it mostly stays below 3,500 rpm. 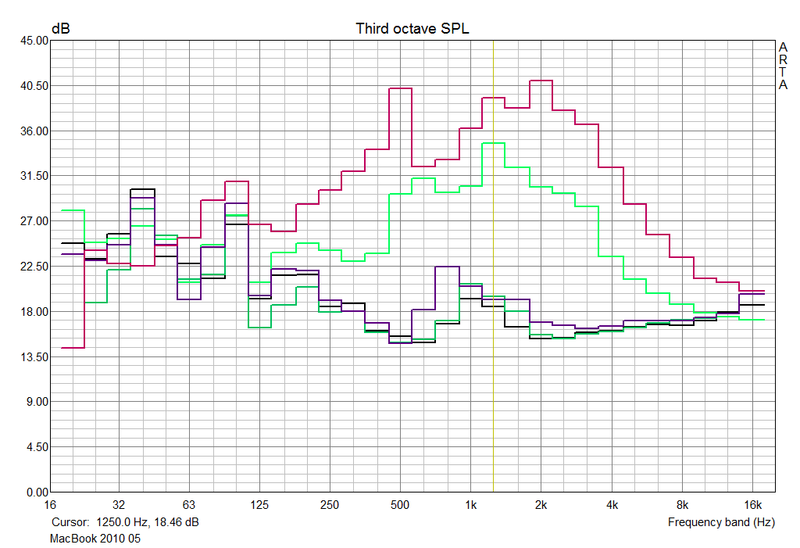 At this speed you only hear a very quiet murmur at 32.5 dB. 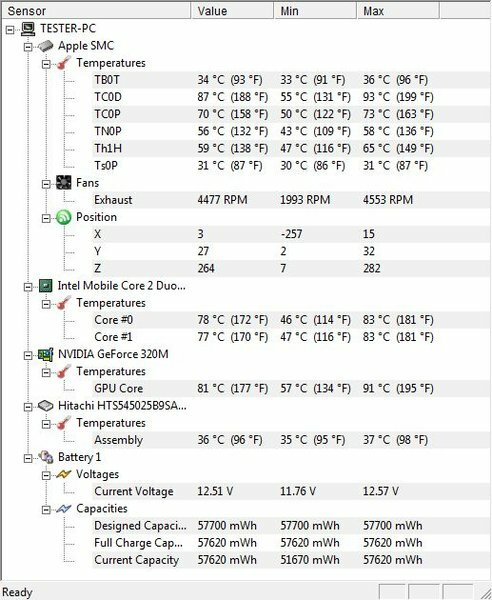 When we did some gaming in Windows, the fan stayed below 35 dB, but we could ramp it up to its maximum speed using Furmark and Prime95. 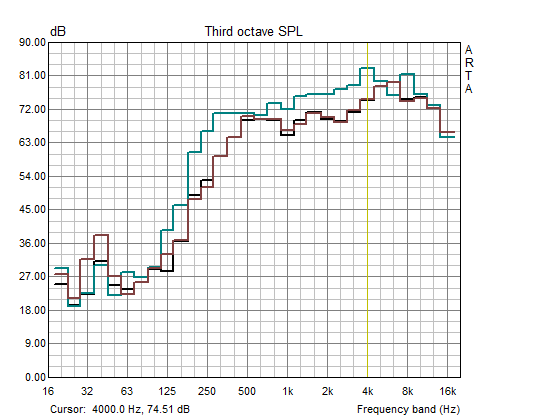 This took it to a volume of 42 dB which is clearly audible (and includes some quiet, higher frequency tones), but not annoyingly so. 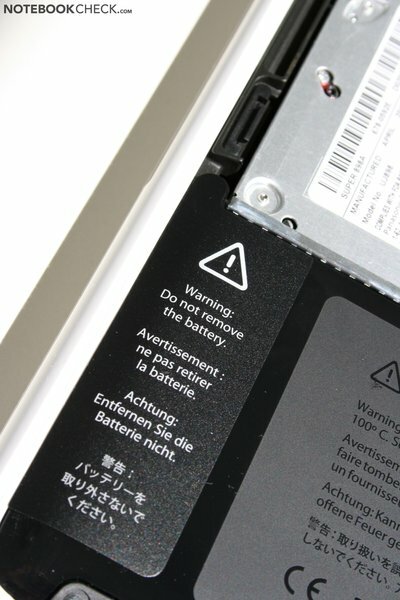 Because of the slow, quiet fans that Apple MacBooks come with, their surfaces tend to heat up more than other laptops. But the MacBook's temperature in idle is no cause for concern - in fact, the polycarbonate case stays very cool with a maximum of 26°C. There were also no alarming temperatures when running Windows 7 and playing games on the machine (maximum 41°C). 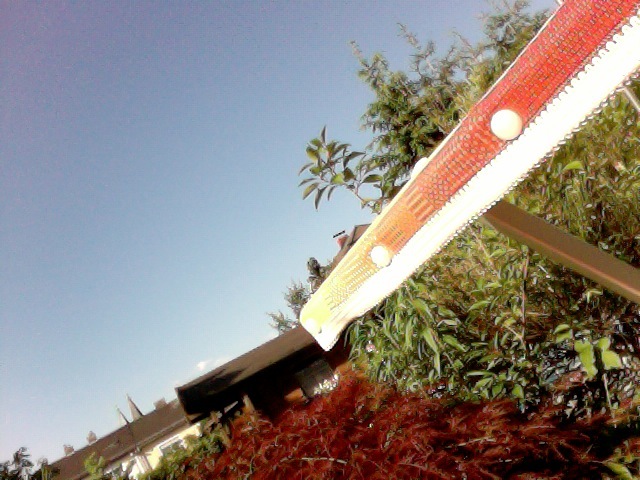 The all-important palm rest area stayed at a manageable 31°C. Under an extremely heavy workload (running Furmark and Prime95 for several hours) we measured a maximum temperature of 44°C, which is not at all concerning. (±) The average temperature for the upper side under maximal load is 36.8 °C / 98 F, compared to the average of 30.9 °C / 88 F for the devices in the class Multimedia. 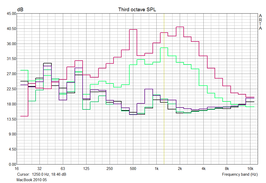 Internal temperatures also stayed within reasonable bounds during the Furmark and Prime95 stress test. The processor cores were still well below their theoretical maximum temperatures, showing a maximum of 81°C and an average of 78°C. The maximum temperature of the GeForce 320M was rather more extreme at 91°C, but on average its temperature was 81°C. We did not see any throttling during the test, such as was observed with the Core i5 and i7 MBP models. A 3DMark06 test carried out immediately following the stress test gave the same result as before. MacBook (brown and black) compared to the MacBook Pro 17 from 2010-4. The built-in loudspeakers bounce the sound off the screen and towards the user. They can achieve a very decent volume considering the size of the notebook, and the quality is sufficient for watching video content. However, it is hard to enjoy listening to music through them because the sound quality lacks all depth. 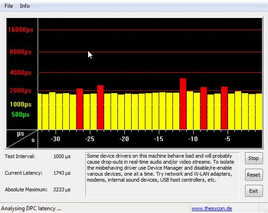 The audio output port, which is suitable for Apple headsets, produced a clean and sufficiently loud signal when we tested it using Sennheiser PXC 250 headphones. 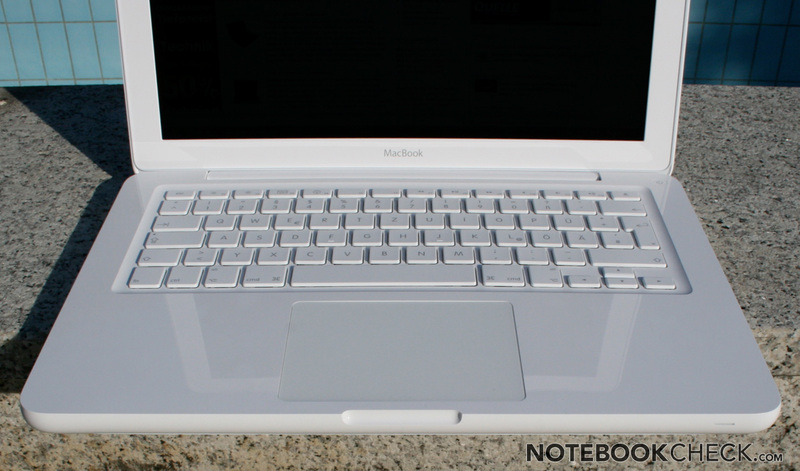 The notebook can achieve outstanding battery life when using the Mac OS X operating system. 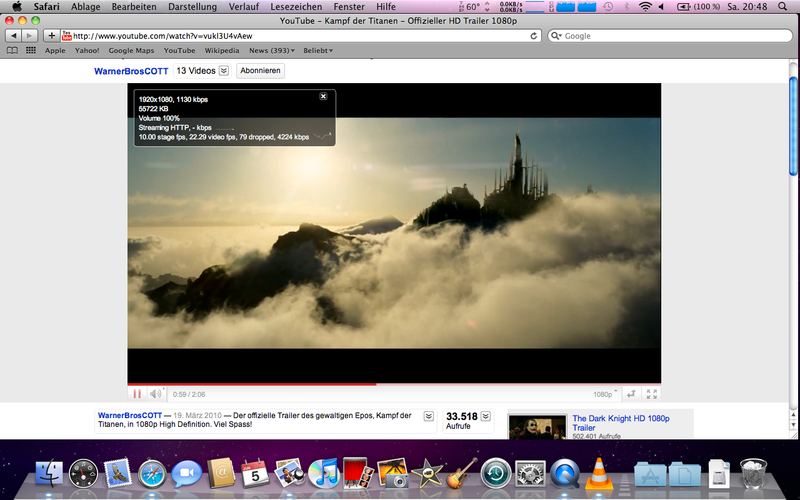 It ran for 11 hours with an open text document, minimum screen brightness and WLAN and Bluetooth switched off. This somewhat unrealistic upper limit for battery life is a slight improvement on the previous model. In the more practical tests which involve wireless internet surfing (including numerous Flash 10.0 videos) and DVD playback at maximum brightness, we experienced a battery life of 4-5 hours. Undemanding internet surfing with a low screen brightness would give a much better battery run time. Half Life 2 Episode 2 (without user interaction) ran for 2 hours 40 minutes before the MacBook had to return to mains power. Running Windows 7 (64-Bit) reduced the battery life noticeably. Here we reached a maximum of 9 hours in the Reader's test (reading text with the lowest screen brightness and all energy-saving functions) and a minimum of 2 hours 11 minutes in the Classic test (heavy use of the GPU and CPU). In terms of energy usage, we once again see how well Mac OS X is tailored to the hardware. 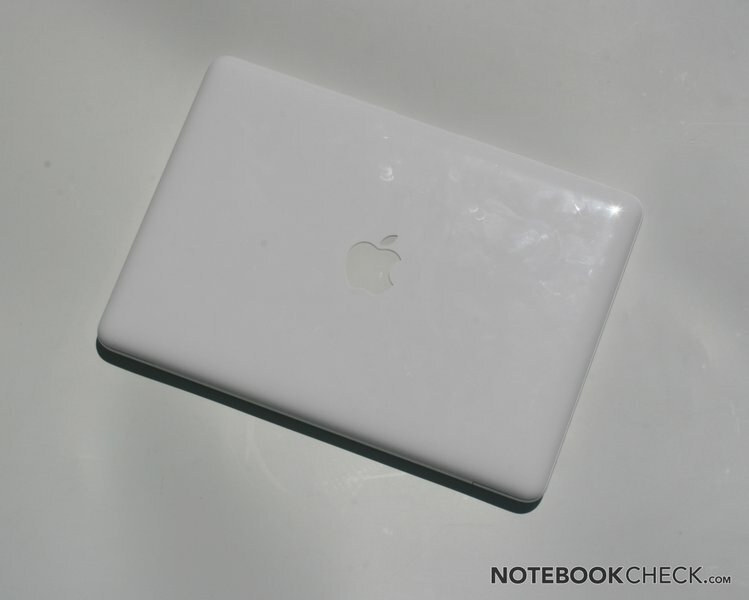 With a minimum consumption of 5.1 Watts without screen backlighting, the MacBook operates at the level of a netbook and consumes over 1 Watt less under Mac OS X than under Windows. And Windows also tends to draw more power when the notebook is under stress; we measured a maximum usage of 58.9 Watts when Furmark and Prime95 were running. However this does not exceed the recommended 60 Watt limit for the mains adaptor (in contrast to the Core i5 and i7 MBP models than we have tested). With an acceptable 0.1-0.2 Watts of energy consumption when in standby, you do not always have to turn the computer off completely. If you had to describe this refresh of the white MacBook Pro in one word, that word would be faster. The new GeForce 320M integrated graphics card is chiefly responsible for the improved performance, along with the faster Core 2 Duo processor. This does not have a negative impact on the battery life, thanks to the 40nm production process and a larger battery - in fact the battery life has improved slightly. 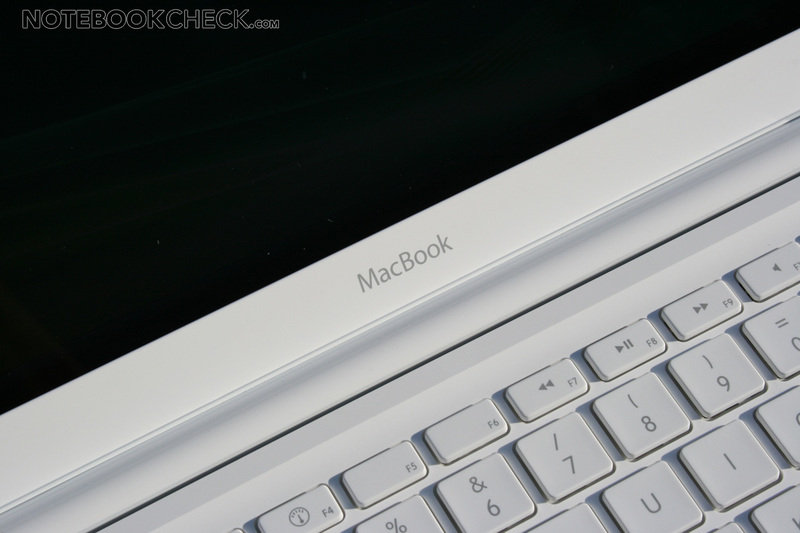 It is likely to be compared to the 13" MacBook Pro given that they have the same hardware specs. Performance-wise there is nothing between them (once you upgrade the white MacBook's memory to 4GB). The main differences are the MacBook Pro's backlit keyboard, brightness sensor, FireWire, SD card reader, and crucially its better screen and wonderful aluminium case. However, it is a little harsh to complain about the plastic casing of the white MacBook. The feel may be a little worse than the aluminium model, and fingerprints are a problem, but it still outclasses a good number of Windows notebooks in terms of good design and overall robustness. 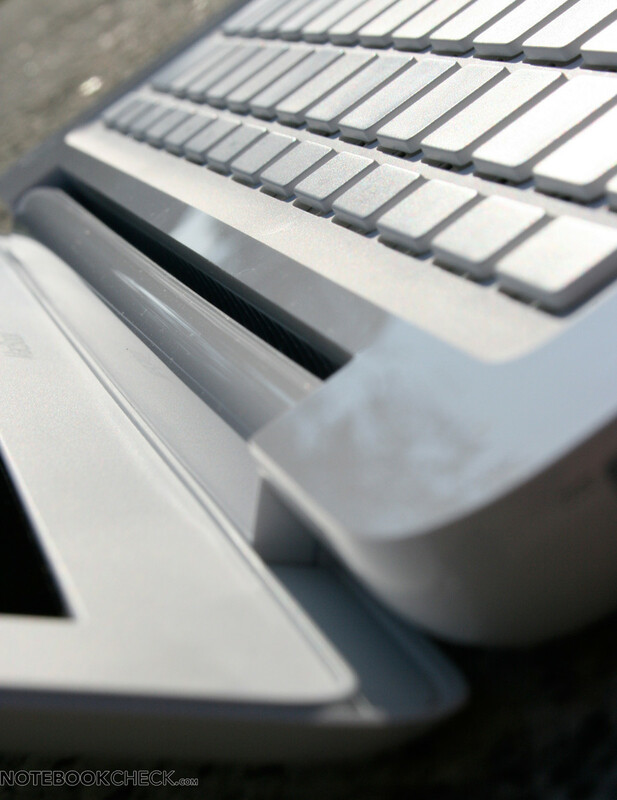 Thanks to its good battery life, low system noise and outstanding input devices, the MacBook strikes us as an excellent portable companion. The only thing that particularly disappoints us is the lack of a matt display for easier outdoor use. The new MacBook 7.1 with GeForce 320M. The free-standing keys are comfortable to use and don't clatter. The keyboard layout is the same as the MacBook Pro models and the desktop keyboard. In sunlight you can just about read the display, thanks to its good level of brightness, but reflections do get in the way. The whole underside of the laptop is rubberized and serves as a base plate. After removing eight screws you can access the insides of the machine. and memory can be changed by the user. 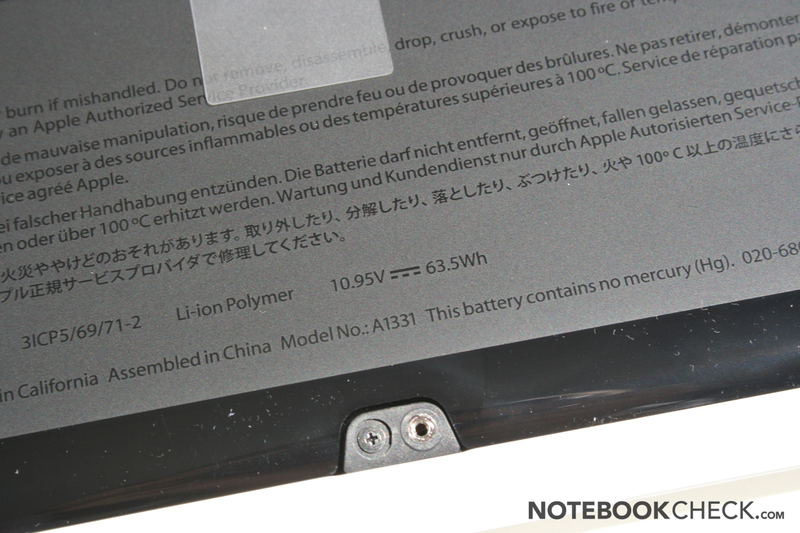 The lithium polymer battery is marginally stronger than before. It still cannot be changed by the user. The mouse button is the trackpad itself, as before. 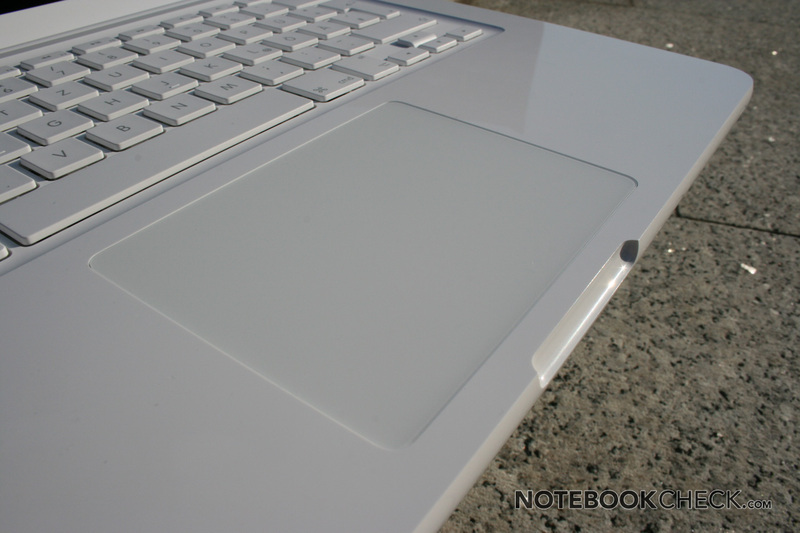 But the glass trackpad is brilliant and now comes with inertial scrolling. It comes in the same familiar design. but with a plastic case. The glass enclosure in front of the screen is also absent. The high-gloss lid picks up a lot of fingerprints. As with the previous model, it comes with the most recent MagSafe plug. The white model is visually rather impressive. And the workmanship is flawless. Apple traditionally skimps on the ports. The single fan is very quiet and mostly inaudible. The good input devices, combined with the long battery life and of course the quiet system noise. The performance of the GeForce 320M, despite not having its own graphical memory. 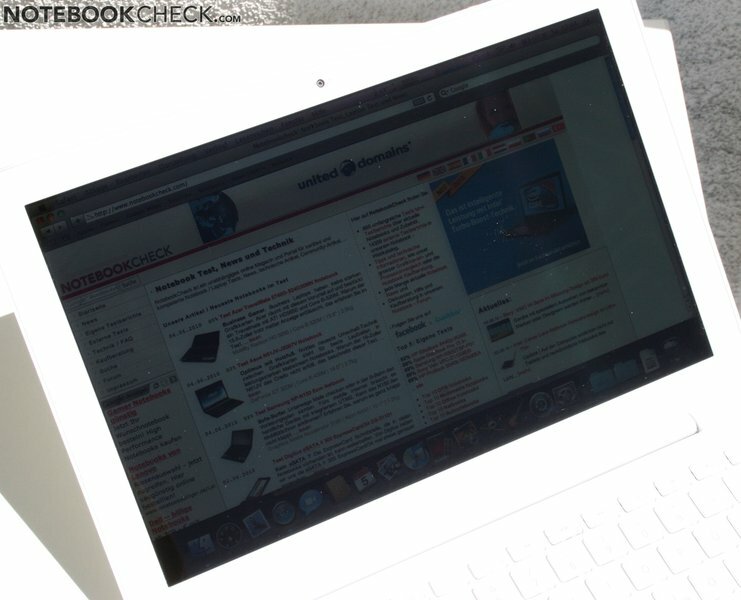 We were also surprised by the many similarities to the MacBook Pro 13". Apple users should certainly consider the 13" MacBook Pro, with its additional features and better screen. 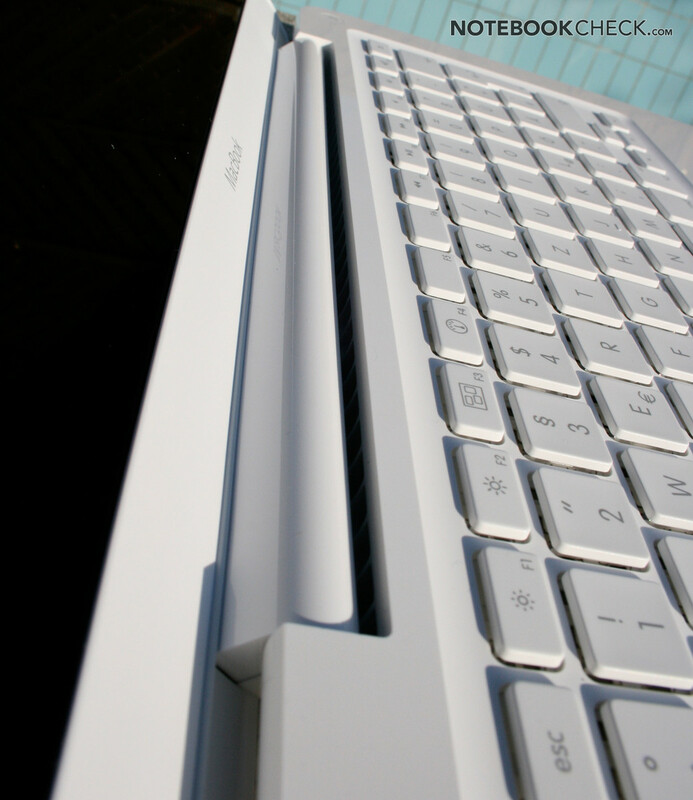 On the Windows side, notebooks such as the Asus U30JC or the Acer Aspire 3820TG TimelineX would be contenders.